Scott Harrison Hogsed began his professional training with the San Francisco Opera Merola program singing the title role in DON GIOVANNI. 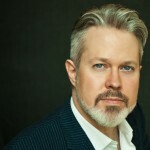 During his five seasons at New York City Opera he sang the roles of Count Almaviva LE NOZZE DI FIGARO, Dancairo and Morales CARMEN, Fritz DIE TOTE STADT, Schaunard LA BOHÈME, Peter HANSEL AND GRETEL, Fiorello IL BARBIERE DI SIVIGLIA and Anthony SWEENEY TODD. Other roles have included Schlemil LES CONTES D’HOFFMANN at Seattle Opera, Angelotti TOSCA at Atlanta Opera, the Baron LA TRAVIATA at Kentucky Opera and Dandini LA CENERENTOLA at the Ash Lawn Opera Festival. Most recently on the concert stage he sang in Orff Carmina Burana with the Owensboro Symphony Orchestra. With the Brooklyn Philharmonic under Robert Spano he sang the title role of Sibelius’ KULLERVO. He was soloist in Handel Messiah with Orchestra Atlanta, performed the title role in Verdi’s UN GIORNO DI REGNO at Caramoor Music Festival, sang the baritone solos in J. S. Bach Mass in B Minor and St. John Passion with The Atlanta Bach Choir, and was filmed for PBS as Ned Keene PETER GRIMES under the baton of Seiji Ozawa. Other recent engagements include the roles of Figaro IL BARBIERE DI SIVIGLIA, Enrico LUCIA DI LAMMERMOOR, Germont LA TRAVIATA, the baritone soloist in Benjamin Britten War Requiem, and Signor Naccarelli in Adam Guettel’s THE LIGHT IN THE PIAZZA at Indiana University. He will be heard later this season in the title role of GIANNI SCHICCHI.